Tried out a Jamaican restaurant for the first time last night. 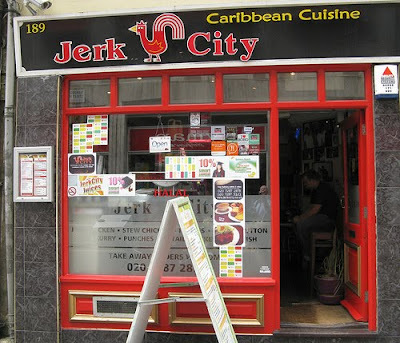 The choice was a place I've passed many times before at the top of Wardour Street - Jerk City. There is Savannah Jerk a couple of doors down which looked a bit smarter but was quieter. I was slightly confused about which one used to be Mr Jerk, but according to TimeOut I subsequently learnt that "When business partners split in 2006, Mr Jerk was renamed Jerk City and The Original Mr Jerk rocked up next door. It changed name to Savannah Jerk in early 2009, following a change of ownership, but the chef and the menu remain the same." "Jerk" - their speciality, which was Jerk Chicken. The chicken was tasty, and doused in what tasted like chilli ketchup (the "Jerk Sauce"?). The choice of accompaniment was either plain rice or "Rice and Peas", which is not, as one would expect, just "Rice and Peas" but instead rice cooked in coconut milk and spices, and the peas are actually kidney beans. Apparently this is nicknamed the Jamaican "Coat of Arms". Mutton aka Goat Curry with Hard Vegetables. The Mutton was amazingly tender and not fatty, in a delicious spicy curry sauce, and for a side the "Hard" vegetables, which consisted of Cassava, pounded and prepared to make bammy, a heavy but tasty starch cake, Plantain, a strange-tasting member of the banana family, and what seemed to be hairy potato. Both dishes came with salad too, presumably which was the purpose of there being a bottle of salad cream on each table, along with the obligatory chilli sauces. Drinks? No beer unfortunately, but instead "Guinness Punch", which tasted remarkably similar to Baileys - a large cup of that felt extremely naughty! Overall a good experience, and about 20 pounds for two good-sized mains and drinks. I'd go back! It will attract people to come by, for sure.